In the previous post, we got started with the python lesson which gave some basic idea about the syntax. 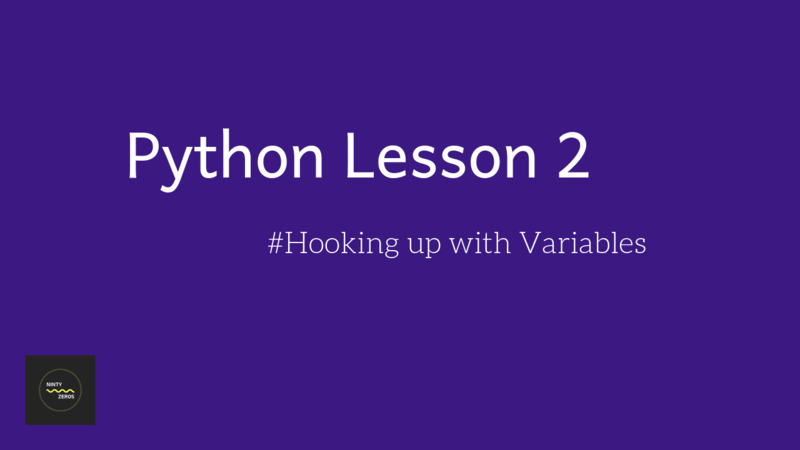 We got started by writing a simple "Hello World program".In this lesson, we are going to get started with understanding variables in python. This lesson is again a beginner course to help you understand the basic concept. This post will cover different types of variables with syntax and deep dive into various type os variables like global & local variables. What are the variables in python? Can we do multiple assigment ? Yes, that's the expected behavior. a, b and c are all set as labels for the same name. If you want three different value, you need to assign them individually. In python, everything is an object, also "simple" variables types (int, float, etc..). When you changes a variable value, you actually changes it's pointer, and if you compares between two variables it's compares their pointers. (To be clear, pointer is the address in physical computer memory where a variable is stored). As a result, when you changes an inner variable value, you changes it's value in the memory and it's affects all the variables that point to this address. a = 6 It's not affect b because a is now points to another memory location that contains 6 and b still points to the memory address that contains 5.
a = 2 It's changes the value of the memory that a is points on, but a is still points to the same address as b, and as a result, b changes as well. a=b=c=1; ###Yes,of course we can bro! We have created a reference to global variable what if i want to delete and re-create a new. How to delete every reference of an object in Python? You can also delete the reference to a number object by using the del statement. The Python garbage collector will delete the object eventually. There is no guarantee in the CPython standard that the object will be deleted immediately, or at any time before the program ends - it depends how often the GC runs - how quickly your program runs, and whether there are circular references - (if two objects refer to each other, even if neither of the objects can be accessed through any names, the ref count of each object will never reach 0). Don’t rely on the ``__del__`` method to be triggered - it might be, but then again it might not. This guide is an overview of Python Data Types. Most of the time Python will do variable conversion automatically. You can also use Python conversion functions (int(), long(), float(), complex()) to convert data from one type to another. In addition, the type function returns information about how your data is stored within a variable. Create string variables by enclosing characters in quotes. Python uses single quotes ' double quotes " and triple quotes """ to denote literal strings. Only the triple quoted strings """ also will automatically continue across the end of line statement. Lists are a very useful variable type in Python. A list can contain a series of values. List variables are declared by using brackets [ ] following the variable name. Tuples are a group of values like a list and are manipulated in similar ways. But, tuples are fixed in size once they are assigned. In Python the fixed size is considered immutable as compared to a list that is dynamic and mutable. Tuples are defined by parenthesis (). Elements to a tuple. Tuples have no append or extend method. Elements cannot be removed from a tuple. You can find elements in a tuple, since this doesn’t change the tuple. It makes your code safer if you “write-protect” data that does not need to be changed. Dictionaries in Python are lists of Key:Value pairs. This is a very powerful datatype to hold a lot of related information that can be associated through keys. The main operation of a dictionary is to extract a value based on the key name. Unlike lists, where index numbers are used, dictionaries allow the use of a key to access its members. Dictionaries can also be used to sort, iterate and compare data. data that is easy to access. can share some example with usage in real algorithms with this data structures.